Notes for Education Northshore Fund's mission is to support efforts to foster and promote the academic and social development of youth through music education and the performing arts. Notes for Education Northshore awards instruments and equipment to eligible music instruction programs. These items are lightly used, blemished or otherwise imperfect and have been collected from manufacturers, retailers and previous owners. The Fund is awarding acoustic guitars, electric guitars, acoustic-electric guitars, bass guitars and the equipment necessary to play these instruments. Other traditional music instruments are sometimes available based on supply. The Grant is open to any public or private school located in St. Tammany parish currently offering a music instruction program. Deadline to submit an application for the 1st grant cycle is January 31, 2019. Give the gift of music this Christmas. Notes for Education Northshore Fund is currently seeking unwanted or gently used instruments. Donating that band or orchestra instrument you no longer use can make a profound difference in a child’s life. Notes for Education Northshore makes it easy to donate your used musical instruments to school music programs in need. We host a platform that makes it a snap to part with your sentimental pieces. Whether it’s a clarinet, a tuba or a set of drums that you donate, students will put it to good use–and the music will go on. If you have an instrument, please bring it to one of our donation locations so another child can receive the gift of music. Be instrumental in supporting quality music and art education in schools! 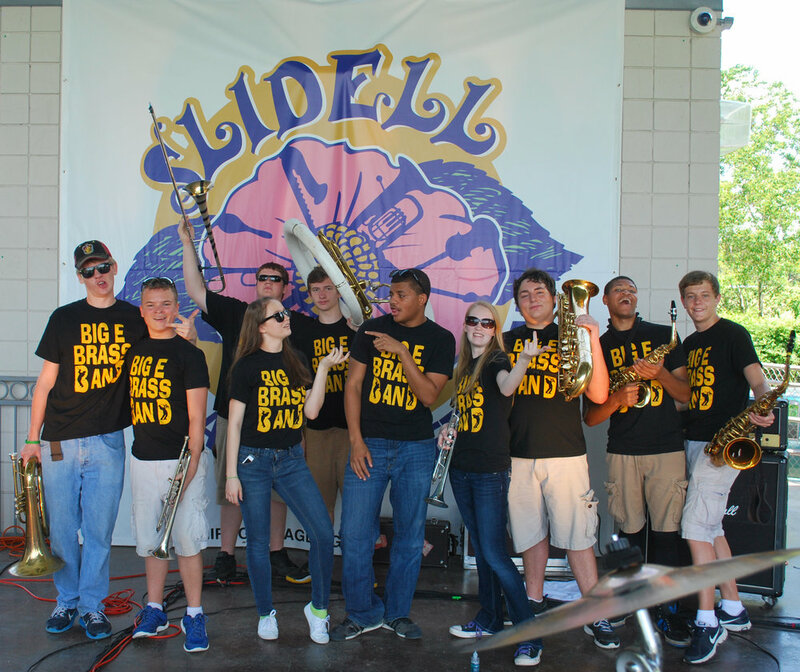 Big E Brass Band; a group of high school student musicians who performed at the Inaugural Slidell Jazz and Blues Festival. Our fundraising event is called the Slidell Jazz and Blues Festival to be held annually in the spring in Heritage Park.